Fresh from filming with ‘The Fall’ Season 2 (BBC) starring Gillian Anderson, local singer, actor and Spotlight Prize Nominee Orla Mullan will join the cast of the Playhouse production for their autumn tour. Orla trained at The Liverpool Institute for Performing Arts (LIPA). Her television credits include ‘Emmerdale’ (ITV), ‘Britain’s Got the Pop Factor’(ITV), directed by and starring Peter Kay, and ‘I’d Do Anything’ (BBC). Her theatre credit include ‘The Secret Garden’ (West Yorkshire Playhouse), ‘Into the Woods’ (The Landor, London), and ‘Down in the Valley’ and ‘Bastien and Bastienne’ (Welsh National Opera). Upon completion of ‘Josef Locke- A Grand Adventure’, she joins the cast of ‘A Christmas Carol’ at The Maxim Theatre, Stockholm for their Christmas season. 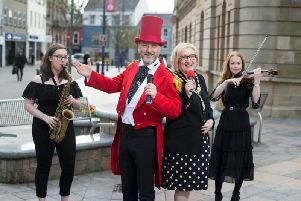 Commissioned by The Playhouse in 2014 in the legacy of UK City of Culture, ‘Josef Locke- A Grand Adventure’ by Journalist and Playwright Felicity McCall has been brought back due to popular demand. A new second act has been added to the play, exploring Josef’s relationships with women and his co-stars. “Josef liked nothing more than to create some much debated intrigue around his relationship with women, and in this new extended production, Orla will play several of the women in his life” director and producer Kieran Griffiths said. Produced by The Playhouse, and written by Felicity McCall ‘Josef Locke- A Grand Adventure’ will come to The Millennium Forum, Derry on Friday 23 and Saturday 24 October before touring to The Lyric Theatre, Belfast from Friday 13 to Sunday 15 November.